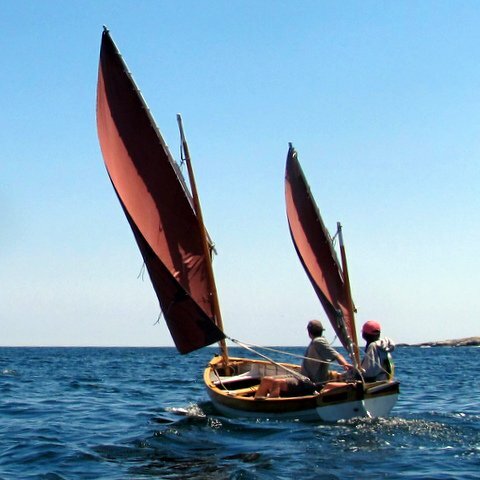 Silver Thread is a replica of a Cornish lug and mizzen used in the inshore fishing and as tender to larger vessels within harbors. The original boat, Summer Haze, was built in Padstow around 1908. Simon Watts found and sailed the Haze for decades before its age started to catch up with it. He didn’t think that the boat’s design should be forgotten, so he took all the measurements starting in 2003 and asked Bill Nielsen to loft it and draw the plans a few years later. Simon rebuilt it as the Silver Thread in his workshop in Nova Scotia, and his family’s been sailing it ever since. Now on a digital copy, the Thread’s plans can be downloaded and printed out for a new project. Special features: Three rowing stations; Balance lug rig that can be brailed up around the two masts. Two rows of reef points in the mainsail. Simon’s son Richard can be contacted at the email below to get the plans. If you have any questions, Simon himself is reachable at simonawatts@earthlink.net.